A few weeks ago, we had the pleasure to run into a pair of glaciologists performing research in Garibaldi Provincial Park. They let us tag along and see what a day of glaciological fieldwork entailed. Their focus was the Helm Glacier, a slender icefield four kilometres southeast of Black Tusk most commonly accessed from the Cheakamus Lake trailhead. Jason Vanderschoot and Mark Ednie arrive at the day’s jobsite. Jeff Slack photo. Helm Glacier is important because it has a solid baseline of data; it has been continuously monitored since the late 1960s. Moreover, multiple photographs taken by mountaineers as far back as the 1920s help give an even better indication of the glacier’s change over time. This change has been consistent: rapid retreat. 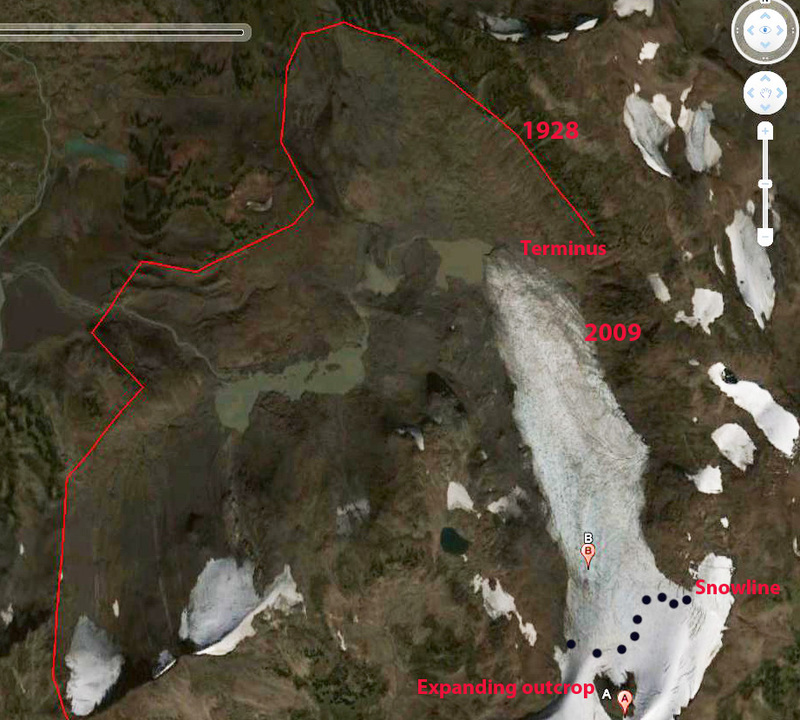 Between 1928-2009, Helm Glacier lost an estimated 78% of its mass, and it has shown no signs of slowing down. In fact, in a database of sixteen North American glaciers with extensive and comparable datasets, Helm has experienced the most rapid melting of them all. The two glaciologists, working for the Geological Survey of Canada, were measuring vertical surface loss, that is, the extent to which the glacier’s surface has dropped since the previous summer. This is done by drilling six-metre long metal poles vertically into the glacier, then returning the following year to measure how much of the pole has become exposed. The drills are human-powered; all the drilling and the hike to the glacier and back makes for a long day of hard, physical work. Fascinating caverns and tunnels are emerging along the edges of the fast-retreating glacier. Jeff Slack photo. Last year’s results indicated that the glacier’s surface had lowered an average of 4 vertical metres on the lower glacier, and roughly 3.5 metres higher up. Numbers still need to be crunched, but preliminary data for this year suggests smaller losses, roughly 2.6 metres at the bottom and 2.2 metres at the top. This is not surprising, as two winters ago our region experienced historically low snowpack levels, followed by a long, hot summer (remember those massive forest fires?). Last winter, Whistler Mountain measured a slightly above average snowpack, and this summer has been closer to average as well. Still, on September 29th (the day we were up there) there was hardly any seasonal snow left on the surface of the glacier. This year was not as hard on the glaciers as last, but we still lost a lot of ice. Hand-drilling five metres down into the glacier is low-tech hard work, but these gus weren’t complaining. Jeff Slack photo. After the Helm Glacier research was completed, the pair headed up to their research station on the Place Glacier, north of Pemberton, to conduct further studies. When compared to similar data from hundreds of other glaciers around the world, this research is creating a fuller understanding of past, present, and future environmental change. Much thanks to these intrepid scientists for the work they do, and for letting us tag along for the afternoon! Helm Glacier Panorama. Jeff Slack photo.